At this post holiday season, the refrigerators of the nation are overstuffed with large masses of turkey, the sight of which is calculated to give an adult an attack of dizziness. It seems, therefore, an appropriate time to give the owners the benefit of my experience as an old gourmet, in using this surplus material. Some of the recipes have been in my family for generations. They were collected over years, from old cook books, yellowed diaries of the Pilgrim Fathers, mail order catalogues, golf-bags and trash cans. Not one but has been tried and proven — there are headstones all over America to testify to the fact. 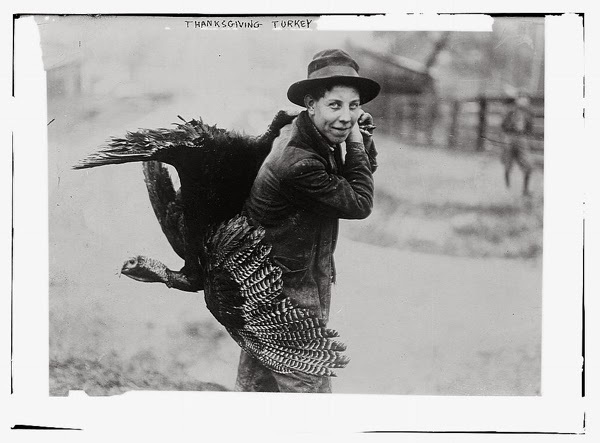 Stolen Turkey: Walk quickly from the market, and, if accosted, remark with a laugh that it had just flown into your arms and you hadn't noticed it. Then drop the turkey with the white of one egg—well, anyhow, beat it. Turkey Remnant: This is one of the most useful recipes for, though not, "chic," it tells what to do with the turkey after the holiday, and how to extract the most value from it. Take the remnants, or, if they have been consumed, take the various plates on which the turkey or its parts have rested and stew them for two hours in milk of magnesia. Stuff with moth-balls. For Weddings or Funerals: Obtain a gross of small white boxes such as are used for bride's cake. Cut the turkey into small squares, roast, stuff, kill, boil, bake and allow to skewer. Now we are ready to begin. Fill each box with a quantity of soup stock and pile in a handy place. As the liquid elapses, the prepared turkey is added until the guests arrive. The boxes delicately tied with white ribbons are then placed in the handbags of the ladies, or in the men's side pockets. Image credit: KurtClark (used with permission).